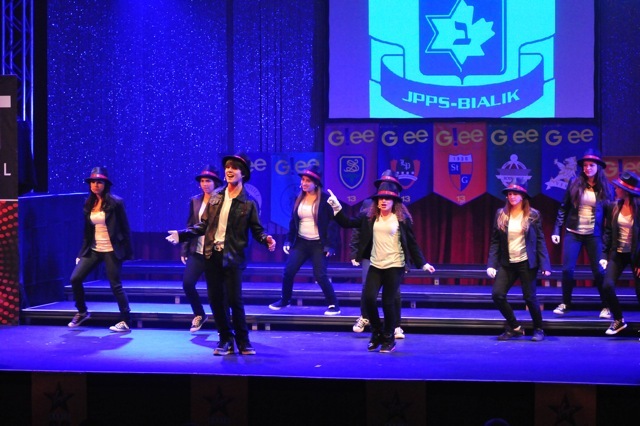 The team from Bialik High School in Côte Saint-Luc, with a superb Michael Jackson Medley, took first place on November 13 at the second annual TNT JFK G!ee High School Showdown. It took place before a capacity crowd of 750 at the Eric MacLean S. J. Centre for the Performing Arts of Loyola High School in N.D.G., bringing in $102,000 for The “Just For Kids” Foundation. The latter raises funds to purchase new, high-priority equipment for The Montreal Children's Hospital (MCH). Bialik in action (photos by Rob Taussig of The Suburban). The Bialik team of Michaela Elhadad, Samantha Leibgott, Jacky Shiff, Jordana Singer, Alizee Znaty, Levana Znaty, Rachel Korman, Brandon Schwartz, Sarah Shtern and Niki Sochaczevski performed an original arrangement by recording artist Kurt Schneider. Team coordinators Diane Dupuis Kallos (affectionately known as DDK) and Samantha Druzin were assisted by John Dodge on vocals and Andree Aiza Styles with the choreography. Dodge shortened the song and recorded the music track. 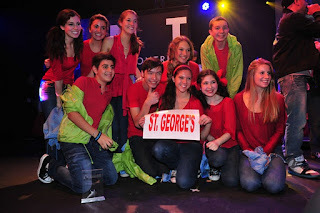 The St. George's Glee team. Defending champions St. George’s School of Montreal came in second, with their version of Van Halen’s Jump. Team members Zac Bensoussan, Sara Diamond, Rachel Kirstein, Michaela Kovic, Polly Mendel, Alex Cohen, Andrea Kaplin, Olivia Kostin-Cohen, Matthew McPherson and Patrick Park were expertly guided by drama and theatre teacher Candace Grynol. Despite the fact she is on maternity leave this year, Ms. Grynol has been on campus and will continue to be all year to operate the highly successful St. George’s Glee Club. Since its creation two years ago, the club has held much anticipated multi-sellouts shows each May. Work is already well underway for the May 2012 presentation. Staffers Aaron Stamboulieh (resident computer boss) and Stephanie Blum (science teacher) lent Ms. Grynol helpful hands. Royal Vale High School of N.D.G. finished third after an energetic performance to the tunes of Freedom- All Stars, Price Tag by Jessie J and Everything is Everything by Lauryn Hill. Team members Kaya Benskin, Katara Dopwell, Ranee-Inez Henegan-Comeau, Ryan Vottero, Keamar Browne, Thayda Grey, Kanika McKenzie and Janessa Williams were guided by Bariyah Wright, Jodie Thompson and Selana Lobo. 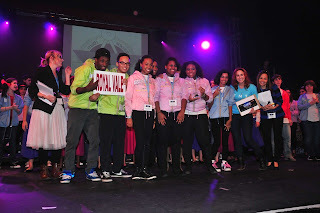 “Thanks to the astounding popularity of the Emmy and Golden Globe winning television show Glee, teens throughout North America are embracing the Glee phenomenon by performing their own Glee music/ dance routines” said Ali Greenberg, chairperson of the TNT JFK G!EE High School Showdown. “So we decided to create a platform for the kids to have their own glee-like competition. JFK is comprised of approximately 200 volunteers across four chapters throughout the island of Montreal, each one hosting an exciting fundraising event within the community each year. 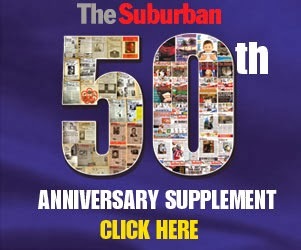 Now in its milestone 25th year, JFK has purchased over $7.5 million worth of equipment that the MCH might not have otherwise been able to procure within its own budget limits. This was a highly entertaining afternoon, hosted by Virgin Radio hosts Cousin Vinny and Tony Stark. Andrea Collins, another on-air personality, was one of the judges. Total Entertainment coordinated the music while drummer-vocalist Paul Lizzi kept everyone hopping in between school performances, The Royal Vale Bollywood Troupe, a group of Grade 3 elementary students, brought the house down while the Pack Boys showed the audience why they won silver at the 2011 Canadian Hip Hop championships. Cousin Vinny and Stark proved to be excellent auctioneers, starting the bidding at $100 and getting $1,000 for a signed and framed script by the actual Glee TV show cast. Lisa Steinberg, the president of the executive of Just For Kids, stated that monies raised will go to the hospital’s “Rest Assured” campaign, benefiting the Anesthesia Service. Steinberg sent a very important message at the start of the event when she asked everyone to rise who ever had a child as a patient at the hospital or ever visited the hospital for any reason. Few people remained in their seats at this point. Congrats to Greenberg, Steinberg and other stellar volunteers who made this event happen: Jill Aberman, Amanda Chicoine, Steven Eisenberg, Fran Goffman, Barbara Kurtzman Phillips, Sandra D’Elesio Lanno, Lynda Lubin, Tina Maniastis Troulis, Randi Milstein Cohen, Jill Morganstein Kimmel, Marla Oringer, Eden Polansky Flomen, Bridget Sachs, Jo-Ann Toulch, Ying Wang and Jillian Zrihen. At the JDF office, managing director Debbie Shapiro is the glue that keeps the operation rolling. Why would Irwin Cotler step down now?